Baltimore and Ohio Railroad was incorporated in 1827. Created to compete with the Erie Canal, the B & O was the first American railroad to transport both people and goods. The railroad continues today as part of CXS Transportation Network. Children can learn more at: Baltimore and Ohio Railroad. Colorado Territory was created in 1861. The borders of the Colorado Territory were the same as the current borders of the state of Colorado. Because gold had been found in the Pikes Peak region, the federal government wanted to establish firm boundaries. The Civil War then delayed statehood. The territory was dissolved when Colorado became a state on August 1, 1876. First televised basketball games occurred in 1940. The games took place in Madison Square Garden and showcased four college teams, Fordham University versus University of Pittsburgh, and Georgetown versus NYU. 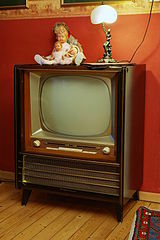 Color television sets were offered for sale in 1954. However, most broadcasting was in black and white, so the sets did not really sell until about 1965 when broadcasting was in color. Megan McDonald (born Pittsburgh, Pennsylvania, 1959) writes books for children. Her books include the Judy Moody series and the Stink series. Children can visit her website, especially the Fun Stuff section, at: Megan McDonald. Donna Jo Napoli (born Miami, Florida, 1948) writes books for children. She writes for a wide range of readers, from picture books to books for elementary school students to young adult readers. Her books include the Sly the Sleuth series, Mama Miti: Wangari Maathai and the Trees of Kenya, and Fire in the Hills. Children could visit her site at: Donna Jo Napoli. Linus Pauling (born Portland, Oregon, 1901; died Big Sur, California, August 19, 1994) was a scientist. He received one Nobel Prize for chemistry in 1954 for research in molecular structure. He won the Nobel Peace Prize in 1962 for his work in trying to stop nuclear testing. He was also famous for his claims that large amounts of Vitamin C reduce the effects of colds and other diseases. Lemony Snicket (born Daniel Handler in San Francisco, California, 1970) writes books for children. His books include the Series of Unfortunate Events and The Composer is Dead. Children would enjoy his website, especially the Dire Diversions portion, at: Lemony Snicket.